I’ve openly stated that there are tax-hiking budget deals that theoretically would be attractive. But notice that “theoretically” is part of that sentence. That’s because in the real world, tax hikes have a poisonous effect on fiscal policy. Instead of being the lubricant that produces concessions from the big-government crowd, the prospect of additional revenue is like putting blood in the water when hungry sharks are circling. The bottom line is that trying to cure deficits with taxes is like trying to cure alcoholics by giving them keys to a liquor store. Indeed, the New York Times accidentally proved my point by putting together a chart showing that the only successful budget deal was the one that cut taxes instead of raising them. So this is why I’m a huge fan of Americans for Tax Reform’s no-tax-hike pledge. Simply stated, I want to restrain – and hopefully reduce – the burden of government spending. And that definitely won’t happen if politicians think more revenue is an option. So I get excited any time voters express the same sentiment. As such, you can imagine my feeling of happiness that Michigan voters overwhelmingly rejected a big tax increase that was supported almost the entire political establishment. Here are some of the joyous details from a Detroit Free Press report. With all counties reporting, 1.4 million Michiganders voted no on Proposal 1 while less than 351,000 voted yes, according to the Michigan Secretary of State’s office. The 80-20 rejection may be the most one-sided loss for a proposed constitutional amendment in state history. …Proposal 1 would have hiked the state sales tax to 7% from 6%, taken the sales tax off fuel sales, and hiked fuel taxes — raising close to $1.3 billion extra for roads. When fully implemented, the plan would have also generated about $200 million a year more for schools; $116 million for transit and rail; sent $111 million more to local governments; and given a $260-million tax break to low- and moderate-income families through restoration of the Earned Income Tax Credit. If the Michigan earned-income credit works the same way as the one in Washington, it’s not a tax break. It’s simply a wage subsidy, a form of redistribution that gets laundered through the tax code. But that’s not terribly relevant for purposes of today’s discussion. What really matters is that politicians were pushing a big increase in the overall burden of spending financed by a big increase in the overall burden of taxation. And they had special interests on their side, which enabled them to out-spend the pr0-taxpayer side by a margin of about 20-1.
the Safe Roads Yes committee, which pushed for a yes vote on Proposal 1, reported raising $9.6 million to spend on its campaign. Of that, $5.8 million came from the Michigan Infrastructure & Transportation Association, a lobbying group for road builders and their suppliers. …The main no committee, the Coalition Against Higher Taxes and Special Interest Deals, reported raising just under $500,000 as of Monday. But special-interest money doesn’t necessarily translate into votes. At least it didn’t in Michigan on Tuesday. By the way, I’m not claiming voters always make the right choices. As we saw from referenda in Oregon and California, they can sometimes be lured into voting yes on tax hikes if they’re told “the rich” are the only ones who will pay. John Miller of Hillsdale College (site of my flat tax v. fair tax debate) explains that the politicians in Lansing were simply too greedy. Writing for the Wall Street Journal before the vote, Miller suggests voters were unhappy that they were being asked for a big tax hike, when 40 percent of the money was going to be diverted to non-transportation purposes. 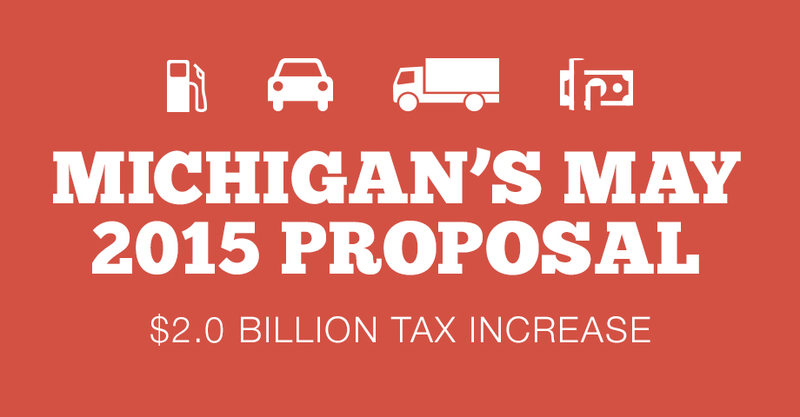 …the measure would generate more than $2 billion in revenue a year. Yet the amount that would go to transportation—mostly roads and bridges, but also bike paths, light rail and “streetscape” projects that aim to improve the look of downtown areas—is only about $1.2 billion. …In other words, taxpayers will get less than $1.2 billion in roadwork for the price of more than $2 billion. How typical. Politician proposed a tax hike for one reason, but then hijacked their own plan and made it a Christmas tree of special-interest spending. P.S. Here are my five policy and five political reasons against higher taxes in Washington. P.P.S. The international evidence also shows that higher taxes are a recipe for bigger government and more debt. P.P.P.S. I don’t fixate too much on the bias of the establishment media. It’s annoying, to be sure, but it doesn’t help to get all agitated about things outside of my control. That being said, I thought it was very revealing that the home pages of both the New York Times and Washington Post didn’t have any stories on the Michigan referendum. If the vote had gone the other way, I feel 99 percent confident in stating that the story would have been prominently displayed with lots of “analysis” about why the vote was hugely important. P.P.P.P.S. Needless to say, Republicans who refuse to take the no-tax-hike pledge should be viewed with considerable suspicion. Zorba, they rejected more wasted funds. If the funds were used properly (and the past history shows they have not been) it may have had a different result. Now if they could just change their tune in presidential elections! Michigan rejects tax by 20-80 margin? Yet voted for Obama 54-46 in 2012? Is there a ranking of states by electoral cognitive dissonance? Something must have shorted in voters’ brains to get an 80/20 vote against children, schools, roads and the poor. Or the politicians promoting them were four standard deviations less competent than average. How can a politician possibly fail at harvesting the voter’s innate propensity towards collective decline? By such a wide margin! I’m sure Michigan voters will come back to their senses soon and resume their developed democracy lemming trajectory to decline.